Nothing is more relaxing than sitting back and watching beautifully coloured tropical fish swimming around in a tank. They dart in and out of the coral and blow out streams of bubbles. Your mind and soul gets rejuvenated and you are ready to face the world again. When you are frustrated and stressed out at work, in a meeting, stuck in the traffic or in a lecture, you won't have a fish tank close by, but you can certainly keep some of these fabulous stress toy fishes in your bag, purse or briefcase. Simply take them out and squeeze away. All your pent up stress will dissolve and you will feel like a new person. These delightful toys are made from a soft pliable material that makes them perfect as stress toys. They can be squeezed and squashed, bashed and smashed and they will return to their original shape. Stress toys are great health boosters, helping people to relax in all types of situations. Our fish come in a selection of fabulous stunning bright colours and are adorable to look at. They look totally real and make great promotional items. Talk to us about branding. Our listed price includes branding of your logo or graphic in a single colour print. 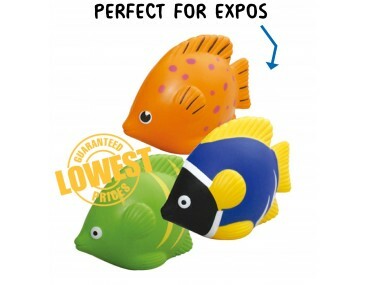 Your clients and staff will be thrilled to receive these cute fish as freebies when you hand them out at trade shows, expos and outdoor events. Please note that our prices exclude GST and a print set up of $75 applies. This product is supplied in bulk quantities. We can supply this product unbranded if required.